On December 17, Sting will perform an exclusive concert in Germany at the FSH Baden-Baden. The programme will feature songs from his new CD, "If on a Winter's Night...," released 23 October 2009 on Deutsche Grammophon. Worldwide, only four concerts, on behalf of the new album, are being planned. Sting's new album conjures the mood and spirit of the season with a diverse collection of songs, carols and lullabies spanning the centuries. Featuring traditional music of the British Isles as its starting point, Sting and guest musicians interpret stirring, folk-based melodies including "The Snow it Melts the Soonest" (traditional Newcastle ballad), "Soul Cake" (traditional English "begging" song), "Christmas at Sea" (traditional Scottish song) "Gabriel's Message" (14th century carol), "Balulalow" (lullaby by Peter Warlock) and "Now Winter Comes Slowly" (Henry Purcell). 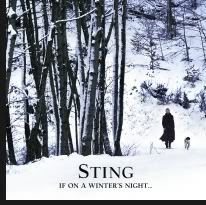 Two of Sting's own compositions are also featured: "Lullaby for an Anxious Child" and "The Hounds of Winter," which originally appeared on his previous release Mercury Falling. A Winter's Night..." features an ensemble of 35 internationally esteemed musicians, including Sting's long-time guitarist, Dominic Miller.